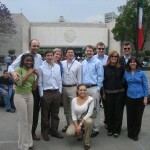 My wife and I attended the Mexico City GBE during Spring Break 2008. 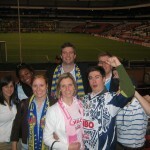 This GBE was one of several “Global Business Experiences” offered by the Darden faculty. Our trip was led by Professor Peter Rodriguez and the participants included 12 Darden students and 2 partners. GBEs at Darden generally have a significant academic element and students receive course credit. The Mexico City program consisted of four main components, which are outlined below. More details are also available on the Darden webpage. 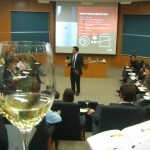 Business cases – we discussed 5 cases with IPADE students on issues relevant to Mexico. The IPADE professors made sure to involve us in these discussions and Darden students seemed to receive their fair share of cold calls. Guest speakers – presentations and Q&A sessions with 5 business leaders from various industries including entertainment, retail sales, and beverage distribution. Some of the speakers used English and others used Spanish along with the translation service provided by IPADE. Company visits – trips to Barcadi, Grupo BIMBO (an industrial bakery with several brands including Wonder Bread), and Kidzania (an amusement park for kids). Cultural visits – we visited the Anthropology Museum, climbed the pyramids at Teotihuacan, attended a soccer game, and participated in a wine tasting. We also received some cultural exposure by working on a group project with the IPADE students. This trip left me with several insights on the cultural and business environment in Mexico. I also gained a new respect for the scale and maturity of the US business school market. There are 4 well know full-time MBA programs in Mexico and the combined graduating class of these programs is around 200 students per year. In comparison, US News ranks 63 full-time US MBA programs and the combined graduating class of these programs was 12,500 students in 2007. While many of the 63 US programs may not be as reputable as the 4 programs in Mexico, and the US has 3 times the population of Mexico, there is still a huge difference in the relative size of these two markets for MBA education. Another aspect of this trip I really appreciated was Professor Peter Rodriguez’s involvement throughout. Peter participated in every activity including classroom discussions, company and cultural visits, dinner each night, and the soccer game. Since this was his fifth time leading the Mexico City GBE and the Mexican economy was part of his Ph.D research, Peter was able to provide us with a substantial amount of information on the business and cultural aspects of Mexico. Nice description of your GBE experience. Seems the GBE was a good mix of school work and social activities. What about GBE plans in 2nd year?